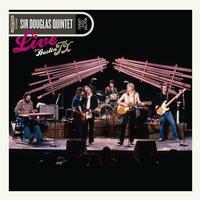 Recorded for the "Austin City Limits" television show in 1981. Doug Sahm is joined by Augie Myers and original Quintet drummer John Perez, along with son Shawn Sahm on rhytm guitar, Speedy Sparks on bass, and Alvin Crow on guitar. The Sir Douglas Quintet rocks the ACL audience, performing classics like "She's about a Mover" and "96 Tears." "Few 1960s garage-band rockers enjoyed a more eclectic and enduring career than the late Doug Sahm. After his Sir Douglas Quintet recorded a string of hits, including 'She's About a Mover' and 'Mendocino,' Sahm released both country and blues albums as a solo artist and subsequently formed the Texas Tornados as a Tex-Mex, Grammy-winning supergroup. This 1981 Quintet reunion performance, recorded for the 'Austin City Limits' series, finds Sahm and band touching all those musical bases, with Augie Meyers (also Sahm's partner in the Tornados) providing the signature, telegraph-key organ and Alvin Crow serving as a vocal and instrumental foil for Sahm.